Guildford Museum houses a vast collection of items representing the history of life in Surrey. The permanent exhibitions represent the history of Guildford and its surroundings, from prehistoric times through to the 20th century, whilst a programme of temporary exhibitions examines particular aspects of Guildford’s history in greater detail. In total the museum has over 75,000 exhibits, spanning tens of thousands of years of local history, from Lower Palaeolithic stone tools through to a detailed model of Guildford Railways Station in the 1920’s and a green velvet suit purchased in Carnaby Street, London, in the 1970’s. The collection can be divided broadly into four sections, covering Archaeology, Needlework, Local History and Art. The collection of the museum’s archaeological items began in 1854 with the creation of the Surrey Archaeological Society. Since then it has grown to contain local finds as varied as flint axes, scrapers and arrow heads, Roman coins and religious headdresses, finds from excavations around Guildford Castle, and Tudor artefacts from the excavation of Farnborough Hill Convent. Although many items are not on display it is possible to request access with prior notification, and the museum provides ‘hands on’ areas where visitors can pick up and examine exhibits typical of those on display. The needlework collection is an important resource for the study of labourer’s clothing from the 17th century onwards , including an excellent collection of Surrey workmen’s smocks. In addition to the smock collection includes samplers, quilts and tools of the trade. The Local History collection concentrates on the social side of life in Guildford, representing the daily life of Guildford residents across the centuries. There are exhibits covering local trades and industries, society life and childhood in Victorian England, including a wonderful collection of Victorian toys. The Victorian garden designer, Gertrude Jekyll, the artist John Russell, and the author, Charles Lutwidge Dodgson, better known to many as Lewis Carroll, all lived and worked in Guildford so it is no surprise to find that there are permanent exhibits devoted to their lives and achievements. Gertrude Jekyll in particular was an avid collector of items relating to the history of Surrey and, in 1907, she donated her collection to the museum, including items as diverse as a napkin believed to have belonged to Elizabeth I and fragments from a WWI Zeppelin bomb that fell near Guildford! 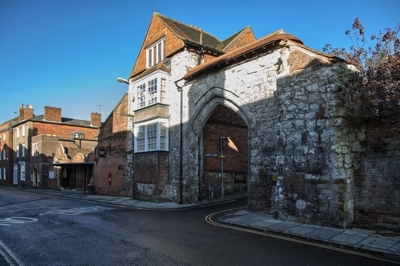 In 2009 Guildford Museum was merged with Guildford Guildhall, the castle and Guildford House to form an overarching organisation known as Guildford Heritage. Consequently, the museum now has access to the works of art formally reserved for visitors to Guildford House, including much of Guildford Borough’s collection or paintings. Amongst these is the world’s largest collection of pastel portraits by the Guildford born and educated artist, John Russell. Russell’ s other works hang in numerous galleries including the National Gallery and the Museum of Methodism. The museum is open Monday to Saturday, including Bank Holidays, from 11am to 5pm. Visitors must arrive no later than 4.30pm. There is no charge for admission to the permanent exhibition or the various temporary exhibitions held within the museum.